OK, so on a technical count they’re not in our division but, as Lanterne Rouge has surmised in a recent post, Birmingham City belong to the Greater Championship. Prior to the beginning of the season, the Blues’ football had been awfully attritional for some time and we jumped on the bandwagon to wave their sorry Brummie behinds goodbye, so it only seems fitting that we should congratulate manager Alex McLeish on a job well done thus far. Roger Johnson and Scott Dann have been every inch the players we hoped they could be, and Lee Bowyer has proved a country wrong in the centre of midfield; from highly promising ‘keeper Joe Hart right up to their devilishly hard-working forward line, it has been a delight to watch this City side ruffle Super Seven down. What a treat it was to predict, with confidence, that United would come away from St Andrews with less than three points on Saturday and get it spot on? How disappointed was I, then, to see McLeish almost angrily refute the claim that his side should be looking up, rather than down, the table in his post-match press interview? 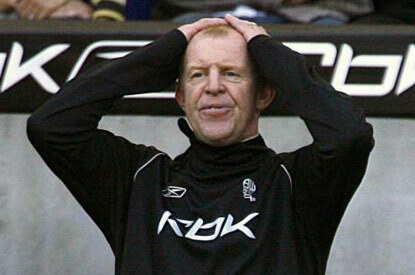 These days it seems that managers are so petrified of what might lay in store around the corner that they can’t just enjoy the moment and indulge in a little glory; rather than back-slapping the team publicly and reaching for the stars, McLeish appears instead to have been schooled in the dark arts of expectation management. Spitting those feathers right back at us, he railed: “I’m hearing all this talk about Europe but it’s absolute nonsense if people talk that way.” As if living bluenoses have ever really had top-flight success to cheer about? Fair enough, City have played the underdog to get where they are, but lighten up Al because those who look inwards for too long end up on the heap. Agree that it's good to see the Blues upsetting the usual order but would actually defend McLeish's stance to the press. The moment he begins to publicly acknowledge the possibility of Europe or a top half finish, he diminishes the pressure-off perception of his team as plucky overachievers, going into every match as underdogs. I've had to set local prejudices to one side, eat my words, and admit that McLeish has done a great job at St Andrews this term. I find it ironic that Blues' great unbeaten run started with the arrival of Carson Yeung; after years of prudent financial management under Sullivan and the Golds, the Hong Kong businessman's takeover was clouded with uncertainty – and yet, so far at least, he's been a lucky charm. McLeish is right to be cautious though – as I know only too well – a top 10 Premier League finish can quickly turn to relegation the next season. That said, Yeung's millions should stave off too many problems. Hart seems to be getting all the plaudits at the moment, but what about Roger Johnson – best buy of the summer?